Another neighbour paid us a visit today. A bank of fog has settled in over the French Shore for the past couple of days and that has clipped our wings a bit. Here are a few random shots that I haven't posted until now. 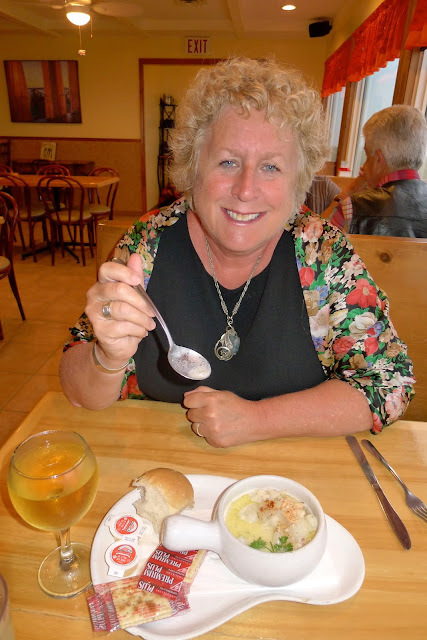 A wonderful bowl of seafood chowder followed by a delicious plate of Coquilles St. Jacques. The glass of white wine was barely drinkable but I mustered through. Acadian pride as far as the eye can see. And then some. Beautiful homes and gardens dot the French Shore from Salmon River right up to Belliveau Cove. Two adirondack chairs out in a meadow patiently waiting for a pair of bums to occupy them. We visited the Ma Wi Omi camp showcasing Metis and Mi'kmaq arts and culture. I would LOVE to sleep in that tipi. Smugglers Cove. American rum runners used to hide their booze in the cave during Prohibition. This dog looked so cute laying in the opening of the barn doors. But as soon as I walked up to the fence to snap his photo, he lept up and started to bark at me. Good guard dog! We woke up to sunny, fog-free skies this morning. We are going to celebrate by taking another little day trip.